Learning Spanish Words Through Etymology and Mnemonics is the first book in the Learning Words Through Etymology and Mnemonics series (the second being Learning French Words Through Etymology and Mnemonics). It makes use of etymology to help you remember Spanish words, and failing that, suggests a mnemonic. Combination of these two approaches in one book separates it from other books on the market. The amount and depth of etymology is carefully chosen to be practical and not overwhelm an average reader. The suggested mnemonics aim to help an educated English-speaking person. An adult or young adult who likes learning vocabulary with some word analysis instead of rote memory will find this book to be helpful and a joy to read. With about 3000 words selected from 15000 in the Real Academia Española corpus sorted in frequency order, this booklet can be used either as a dictionary or for leisure reading. The hint provided for each word is particularly helpful for short-term memory needed in taking an exam, while the etymological and cultural information will serve you for years to come. 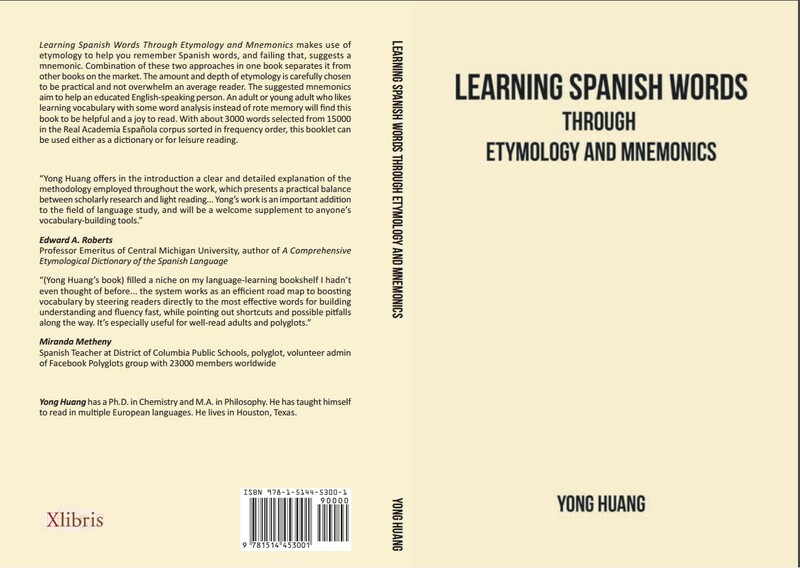 "Yong Huang offers in the introduction a clear and detailed explanation of the methodology employed throughout the work, which presents a practical balance between scholarly research and light reading... Yong’s work is an important addition to the field of language study, and will be a welcome supplement to anyone’s vocabulary-building tools." "(Yong Huang's book) filled a niche on my language-learning bookshelf I hadn't even thought of before... the system works as an efficient road map to boosting vocabulary by steering readers directly to the most effective words for building understanding and fluency fast, while pointing out shortcuts and possible pitfalls along the way. It's especially useful for well-read adults and polyglots." All proceeds from the sale of this book are donated to Wikimedia Foundation and OneSky.org. Major: Amazon Kindle edition if read on its online cloudreader loses all bold font style; all headwords are in plain font. And the book is not searchable. Reading it offline with Kindle reading app solves both problems. Specifically, go to www.amazon.com/gp/help/customer/display.html?nodeId=201245960 to download and install the Kindle reader. (I installed version 1.17.1 on my PC.) Open it. Logon to Amazon if prompted. Then in Downloaded, you'll see this book. Open it. Click the magnifying glass to the left of the app window to do word search. * Headword éxito (p.28): éxito in the text, twice, should be in italic. * Headword pelo (p.48): "Cognate with Latin pilus" should be "From Latin pilus". * Headword misa (p.85): æ should be in italic. * Headword litro (p.123): The second "liter (cognate)" is meant to be "litre (cognate)". * Headword mora (p.124): "See also morado ("dwelling")" should be "See also morada ("dwelling")". The word morado should be a separate headword entry, and its sense of "purple" is from the color of mulberry. In both entries, there should be "Not to be confused with morada/morado" notes. * Headword aéreo (p.128): área should be in italic. * Headword catedrático (p.132): "Alco" should be "Also". * Headword piscina (p.133): "Cognate" should be "Doublet". * Headword volante (p.142): volar should be in italic. * Headword pretender (p.149): pretend in "English pretend" should be in italic. * Headword arce (p.166): "Cognate" is followed by an extra "with". * Headword calificar (p.166): "change" should be "to change". * Headword torpe (p.180): missing quotation marks in the parentheses for turpitude. * Headword ancilla (p.192): Ths chemical symbol for silver should be Ag. * Headword flecha (p.197): On line 4, "your" should be "young". * Headword bendición (p.200): "From From" should be "From". * Headword rotundo (p.202): redondo should be in italic. * Headword aval (p.219): à valoir should be in italic. * Headword vagar (p.227): The blank line following this line should be removed. * Headword estirpe (p.229): "extirpate" should be "with the root of extirpate". * Headword fosa (p.231): The sentence in the middle should be "If you don't know the medical term fossa, associate the first syllable of fosa with foundation and think of the low base". * (Paperback only) Index hombro (p.265): Should be "hombro 69,(13)". * Headword corazón (p.28): While suffix -ón is normally augmentative, corazón refers to "heart" regardless size. But one scholar said that the word originally referred to the heart of a warrior or lover. * Headwords peligro, peligroso (p.38), milagro (p.93), Argelia (p.160): The alternative explanation is the metathesis between r and l in the word. * Headwords mentira, mentir (p.83): Also cognate with mendacious, mendacity. * Headword pelota (p.85): Also cognate with pellet. * Headword desayuno (p.111): English breakfast literally means "breaking i.e. ending fasting", just like desayuno does. * Headword comarca (p.133): Another theory maintains that -marca is cognate with margin. * Headword cabildo (p.179): Also cognate with capital, which may better help remember this word. * Headword pizca (p.193): Use a mnemonic such as "a small piece of pizza". * Headword suspiro (p.195): The root is also cognate with the root of aspire (originally "to breathe onto"), conspire (originally "to breathe together"), inspire ("to breathe in"), etc. * Headword colchón (p.216): Cognate with quilt, quoit, and possibly with cushion, which obviously serves as a perfect mnemonic. * Headword hormiga (p.223): Or as a mnemonic, think of the last Greek letter omega as if it represents something small like an ant. * Headword pepita (p.225): Suffix -ita is diminutive just as -kin is for English pumpkin (also seen in napkin and others). See Wiktionary. By the way, English pumpkin itself occurs more frequently than Spanish calabaza probably due to the Thanksgiving tradition which does not exist in Spanish-speaking countries and to the America-specific pumpkin carving tradition during Halloween. * Last but not the least: Ms. Marina's well-written review correctly points out my casual usage of the term cognate throughout the book. Technically, two words are cognates only if they are in two languages sharing a common ancestor language and the two words independently descend from the origin (etymon) in the ancestor language. Due to the latter requirement, an English word that came from Latin, cannot be a cognate with the Spanish word derived from that Latin word, because the ancestor of English is Germanic, whose ancestor is Proto-Indo-European, which is also the ancestor of Latin (one of the Italic languages). If the English and the Latin words were each independently traced to a common Proto-Indo-European word, they would be cognates; otherwise, they can only be akin or related. Nevertheless, this book adopts a common usage of the term cognate, as understood by most educated English-speaking people not specialized in philology or linguistics. I have a Ph.D. in Chemistry and M.A. in Philosophy. I have taught myself linguistics with an emphasis on morphological and phonological changes in the history of Romance languages, and have learned to read in multiple European languages. Please contact me by email to yong321@yahoo.com or by filling the form with comments or corrections. Why are the words not ordered alphabetically? The e-book does not have page numbers nor the index. Since the book is not strictly a dictionary and is meant to be a study material, I thought ordering the words by usage frequency would make more sense so the reader can go to a section matching his vocabulary level and start to read. I apologize for the problem with the e-book, which I realized after the book was published. Searching the e-book for a word, however, does work. See the instruction in the Errata/Issues section shown above. The book does not actually show etymology for some words. Why? lidiarFrom Latin litigare. The intervocalic g (between two vowels) tends to be dropped when a Latin word entered Spanish (as in the case of integer to entero, legalis to leal, regale to real). And t changed to d through loss of aspiration. chantajeFrom French chantage ('blackmail'), from chanter ('to sing') + -age (suffix for noun). According to J.S. Farmer's Slang and Its Analogues Past and Present published in 1891, some bad guys extorted money from singers to be performing at a London music hall. If they were refused the money, they would hoot and hiss during the show.
.) Had I included all known etymological information for all the words, the book would be many pages bulkier. Another concern is copyright infringement, which is very easy to get into when writing a dictionary-like book; while I can easily adjust word definitions, the generally accepted etymology almost always must be copied as is. At this time, no. Maybe in the future. How long did it take to write this book? How was the time divided in writing it? It took over a year, not counting the preparatory work. About 40% of the time was on etymology, 40% on mnemonics, 20% on the history of morphology and phonology. Nowadays etymology is easy due to other people's work. Mnemonics took longer than expected because it was completely original.